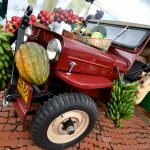 This Colombia tour is quite simply a crash course in the delights, peculiarities and trivialities of Colombian life. So, don’t be surprised if you develop a sudden fascination for magical realism, religion, nature and coffee. Saddle up and take a horseback ride with the locals in Armenia, learn about coffee in the charming town of Salento and play the classic Criollo game of Tejo in Villa Leyva. This is a private tour and you will be accompanied by an English-speaking local guide throughout. The price displayed is per person based on two people sharing. All tours can be tailor-made to suit your interests and requirements. Welcome reception at the airport upon arrival in Bogota. Transfer to your comfortable hotel. In the afternoon, it's time to explore the city in a private half day tour. 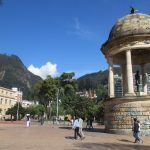 You will have the chance to explore Bogota's colonial centre on foot. Feast on culinary delights and taste the ancient Muisca beverage. Learn about street art and visit the iconic Chorro de Quevedo, Botero museum and Plaza Bolivar. Free evening. Pick-up for a morning flight to Leticia (2h), into the Amazonas Region of Colombia. The town of Leticia is the "Amazonian capital" of Colombia, vibrant and full of life. It's the gateway into the Amazon jungle, a dizzying crossroads where rural meets urban. 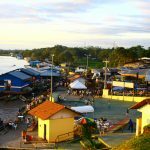 In the afternoon you visit the main square in Leticia and then make the quick trip across to the Brazilian Border town of Tabatinga for sundowners overlooking the mighty Amazon. Then it's back to Leticia, where you can choose your own dinner adventure and crash at the hotel. After breakfast at the hotel, the real adventure into the depths of the Amazon begins. 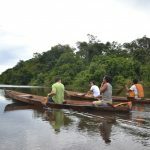 We'll get on board a motor-powered boat and zip down the Amazon to Puerto Narino. After a quick pit stop we head further up a smaller tributary to San Juan de Soco, an indigenous community on the bank of the river. Today is for exploring the community and meeting the local people. Open your eyes to the realities of development and aid. Feel the paradox of tradition and modernity. Hang out with the kids and play some football or visit their school, and go swimming or canoe in the river. Accommodation in comfortable cabins. After breakfast and a nature walk in the morning, we'll make our way to Puerto Nariño. This remarkable place is an ecological community that has struck a balance between man and nature. Here, you can choose to take a walk to the nearby villages of Ticuna and Yagua before lunch back in Puerto Nariño. In the afternoon, we'll get back to our homo-sapiens roots with a fishing and foraging adventure. 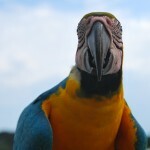 We'll head to the Tarapoto lakes, on the lookout for piranhas and pink dolphins. Try your hand at fishing a piranha and roasting it on the grill. Then head back to Puerto Nariño for dinner on your own and a night out. Accommodation in comfortable cabins. After breakfast head back to Leticia, to decompress and return to some of the creature comforts of "civilization". Then transfer to the airport for a flight to Armenia (approx. 4 hours, including stopover in Bogota). After a trip from the Armenia airport along the winding roads surrounded by green, we'll reach the coffee plantation. Sit back and unwind. We'll have a welcome briefing and a tasty farm dinner. Accommodation is private rooms in the comfortable guest house. In the morning we'll saddle up the horses for a ride through the endless pastures of this gorgeous rural area. Later we'll make our way across to Palermo, home to an amazing farm based on sustainable methods. Here, you'll meet the gregarious grandmother herself and the whole family. They'll tell you all about their philosophy of farming and you will get the chance to see how the local toffee Arequipe is made. In the evening it’s a sumptuous local dinner. We'll stay at the farm for the night. Accommodation is private rooms in the comfortable guest house. In the morning you will have the opportunity to milk a cow, try farm work chores, or even lend a hand with lunch. After a fresh local lunch, we'll have the chance to get behind the scenes of coffee production. We'll shadow the staff of a finca to see the entire process from start to finish. 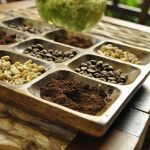 After seeing the coffee process from the field we'll set out in search of the end product and a coffee tasting session in the picturesque town of Salento. You can explore Salento in the late afternoon, before settling down for the night in a comfortable hotel. 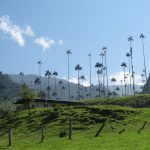 After breakfast in Salento, we hop on an immaculate old Willy´s jeep and wind our way through super-scenic Valle del Cocora, a valley that is famous for its supply of the national tree, the wax palm. You then have the opportunity to take in some mountain air and stroll up the foot hills of the Andes before we head back to Salento for lunch on your own. After lunch, bid farewell to Colombia's unforgettable coffee region and take a return flight from nearby Pereira to Bogota (approx. 1 hour). On arrival, transfer to a comfortable hotel. We leave Bogota in the morning for a drive of about 3 hours that takes us way back in time. The first stop will be Raquira where you can try your hand at clay art taught directly by a local Artisan family. 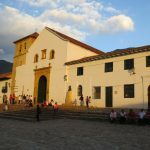 After a delicious home cooked meal in Raquira we head to Villa de Leyva, one of Colombia's loveliest mountain towns. Take in the sprawling main square, colonial-style whitewashed architecture and cobbled streets. This is a portrait of rural towns as they once were. There will be time to wander the streets, browse local tiendas, chat it up with locals, and even find a rousing game of tejo, a traditional criollo pastime that involves flinging lumps of lead at a gunpowder target. Explosively fun! Dinner on your own, then turn in for the night at local hotel lodging. 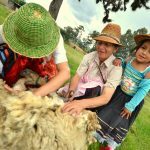 After breakfast in the hotel we head to the home of a rural campesino (farming) family, where we'll have a hands-on wool workshop alongside local craftsmen who will teach you the tricks of the wool trade. After you've used all your energy in creating a woollen masterpiece you can enjoy a hearty home-cooked lunch at the farm. 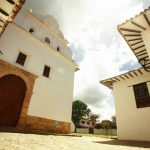 Villa de Leyva boasts numerous archaeological and paleontological treasures, and this afternoon you’ll take a private tour exploring the desert landscapes around the town on horseback or mountain bike. You’ll visit an astronomical site and a museum showcasing various fossils. You’ll also visit Casa Terracota, known as the largest ceramics workshop in the world, where you’ll discover the unique forms, colours and textures of the local products. Free evening. It's time to head home or continue your travels! At scheduled time (flexible), private overland transfer to Bogota (approx. 3 hours). End of tour. No minimum number of passengers required and you will not be travelling with a group of people you do not know. Prices quoted are per person and based on at least 2 people travelling. You should expect a cheaper price for bigger groups. Passport details are required at time of booking. For information on visa requirements and health formalities we recommend you visit the FCO travel advice website or the US Travel Advice Website (direct links to Colombia page). You will need a Yellow Fever vaccination for travel to the Amazon. What to bring: Travel insurance, passport, binoculars, alarm clock, walking shoes, water bottle, daypack, sun protection, insect repellent, sun glasses and hat, swimwear, flip-flops, torch with extra batteries, warm clothes to layer, comfortable light cotton shirts with long and short sleeves, comfortable trousers made of cotton or a light synthetic material (bring at least two sets of light clothes which can be washed and dried easily), shorts, rain coat, plastic ziplock bags, plastic bags for your luggage in case of rain. The Criollo Experience will take you on a journey through some of Colombia’s most beautiful regions. From the high Andes Mountains to the Amazon Rainforest and cosmopolitan cities full of passionate locals – the diversity of Colombia can be overwhelming. The Criollo Experience connects you directly with the locals and is bursting at the seams with authentic experiences that might just make Colombia your new favourite destination. 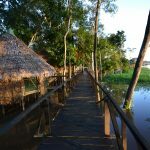 Tagged as active, agriculture, Amazon Rainforest, Andes Mountain Range, artisan fishery, bird-watching, boating, coffee, cultural experiences, ecolodge, handcrafting, hiking, horse-riding, indigenous peoples, jungle, pink dolphins, piranhas, traditional gastronomy, wildlife.